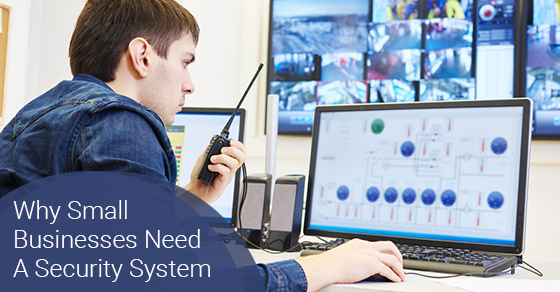 7 Reasons Your Small Business Needs A Security System | Calgary Alarm Inc. It is commonly thought that security systems are only necessary for big businesses. However, even small businesses are not immune to outside threats including burglary or fires. Further, even with a small number of employees, it is not uncommon for employees to engage in theft or to try to gain access to unauthorized areas of your business. These are only a few of the reasons why small businesses need a security system, but additional reasons will be outlined below. Regardless of the size of your business, a security system will be your best investment. There is a range of security alarms, from intrusion detection to fire detection, but all of them offer numerous benefits that far outweigh the initial investment. Security systems, and in particular camera surveillance, acts as a deterrent against various crimes. For example, not only will a security camera reduce the likelihood that your business will be broken into, but you will also reduce — if not entirely eliminate — cases of employee theft. Another benefit of employees knowing they are being surveyed is that it acts as a time management tool, making employees more productive when they know they are being monitored. No business — large or small — is immune to the threat of a fire or carbon monoxide poisoning. This is perhaps one of the biggest benefits that a security system can offer you: the physical safety of you, your employees and your assets. Installing a security system can result in lower insurance (as well as reducing the possibility that your business will suffer financially due to theft or a fire) and even tax breaks, making it a very wise investment. Interestingly, security systems also have been shown to lead to increased customer satisfaction. Intrusion alarms, for example, will sound an alarm if someone tries to enter your building via windows or doors. Access control makes it possible for you to control who has access to your building. This has a variety of benefits even for small businesses, including increased safety by making it impossible that an intruder could gain access to your building. Many security systems make it possible to monitor your business remotely. This will give you peace of mind knowing that your business is safe while also alerting you in the event that something is off. Having hard evidence can also protect you against the devastating damages that can occur if your business was to ever be sued. Even a small business could benefit from a monitoring service to protect your business from the threat of a burglar, fire or flood. Consider Calgary Alarms for your choice of monitoring service — we are one of the best security alarm monitoring companies in Canada. Contact us today for more.